I took the CFA Level II exam at the beginning of June, and unfortunately I did not pass. This is a common result – I’ve talked to many CFA charterholders and virtually all of them failed Level II on their first try. The exam is incredibly difficult because there is a huge volume of material eligible to be tested, but only a small part of it appears on the actual test. Thus, you have to learn the entire curriculum without knowing what will actually be tested. I was in band 6/10 of those who did not pass, so I wasn’t very close. One of the strategies I followed was to concentrate my studies on the two topics that are worth the most points: Equity and Financial Reporting & Analysis. As shown in the screenshot below, I scored in the middle band of 50%-70% correct for those topics. I think that was not quite good enough, and it would be important to get those scores in the >70% band. My two best topics were Corporate Finance and Ethics, on which I scored in the >70% correct band. I didn’t do well on the smaller topics, scoring <50% in Economics, Fixed Income, Portfolio Management, and Quantitative Methods. I also scored <50% on Derivatives. I didn’t put as much time into these topics since they were worth fewer points. 1. The recommendation for Level II is to study for 300 hours. In retrospect I would say that’s correct. I studied about 200 hours and it was not enough. I passed Level I with only 150 hours of study, but that exam was considerably easier. 2. Leading up to the exam, I scored about 50% correct on all my practice exams. This was an indicator that I wasn’t ready and needed a lot more study time. 3. I memorized dozens of formulas and calculation methods, and many of them showed up on the exam. However, there was one particular topic (set of 6 questions) that required intricate calculations, and I just didn’t know the formulas. For that topic, I had actually decided during my studying that it would be too time consuming and difficult to memorize the formulas. So, I decided to take a chance that topic wouldn’t appear on the exam. It did. 4. I took four Mock Exams overall – one from the CFA Institute, one from the BSAS, and two from Elan Guides. They were all considerably different since the exam draws from a huge volume of material. 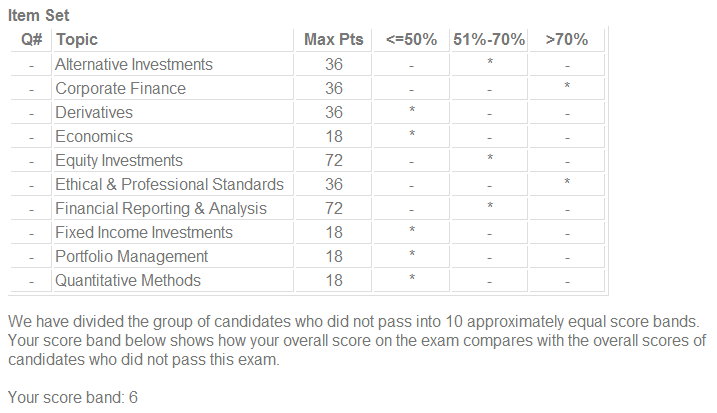 The CFA Institute Mock Exam was probably the most representative of the test, but they only provide one. Overall, this was an incredibly difficult exam. Obviously it’s disappointing that I did not pass, but many current CFA charterholders didn’t pass on their first try either. It’s pretty much universally acknowledged that Level II is the most difficult CFA exam.